Below you will find a list of links to outside websites which we believe to contain useful information. We are not responsible for the content of these websites. Please notify us if you find the contents of any website to be inappropriate. BREC: Baton Rouge Recreation and Park Commission. BRWTA: In 1971-72, the primary mission of BRWTA was not only to provide an opportunity for women to play tennis competitively, but to represent and work for women's interests in Baton Rouge tennis affairs and activities. This mission continues today with almost 400 members. Friend at Court Code (PDF): Have you ever had a dispute with a fellow player over a call on the court that you couldn't settle? Or have you ever wondered why a certain ruling was made during a match you were watching? Maybe you're just curious about how some scenarios, from the common to the ridiculous, are resolved. Click above for a pdf version of the Friend at Court. HPTA: The spirit of community tennis is strong and thriving at Highland Road Park. 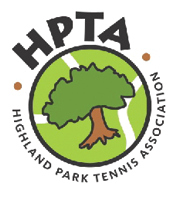 Highland Park Tennis Association (HPTA) celebrates 33 years of continuous tennis for 18 years of age and older and all skill levels. TennisLink: All USTA League Tennis registration will be conducted 'online' using TennisLink. United States Tennis Association: The United States Tennis Association (USTA) is the national governing body for the sport of tennis and the recognized leader in promoting and developing the sport's growth on every level in the United States, from local communities to the crown jewel of the professional game, the US Open. USTA Southern Section: The online home of USTA Southern! Our organization covers tennis enthusiasts across nine states in the South, including Alabama, Arkansas, Georgia, Kentucky, Louisiana, Mississippi, North Carolina, South Carolina and Tennessee. Weather Underground: Need to check the weather before you head out to the courts? Weather Underground can give you all the information you need!